Co-founders Sir Mark Flunder & Gregory Webster really were inspired to pick up guitars by Mark Perry's original Sniffin' Glue manifesto "here's a chord, here's another...go form a band" back in 1976. Flunder soon joined the seminal "Painted Word" era Television Personalities, while Webster came straight outta Luton in Creation's Tweecore faves Razorcuts. 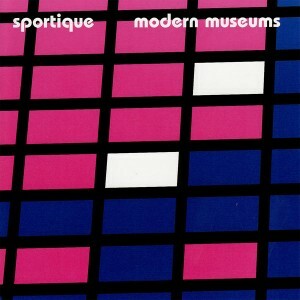 They joined forces in Sportique in 1997, armed with intent to produce year zero new wave for anyone who still cared. John Peel certainly seemed to, and asked them in to record three sessions with him so far, along with almost singlehandedly championing their 1999 debut LP "Black Is A Very Popular Colour" and numerous 7" singles in the UK. Augmented by Rob Pursey & near legendary proto-riotgrrl Amelia Fletcher (both previously Marine Research, Heavenly, Talulah Gosh), Sportique have already produced an incredible body of work among them, and an admiring global fanbase. "Modern Museums" finds them ransacking the post-punk stylistic cabinet of Alternative TV and Magazine whilst dropping mildly obscured references to a host of modern artworks, from Keith Arnatt's 1972 "I am a Real Artist!" to Gilbert & George's LIFE/DEATH sloganeering.